Turn Signals Not Working When Tilt Wheel is Lowered? I have a 2000 F150 and when I lower the tilt wheel the turn signals stop working. When the tilt wheel is up the turn signals will blink as normal, as you lower the tilt wheel the turn signals stop working. Connector in the steering wheel column is loose or broken. If you take the cover off the steering wheel column and take a look at it, you might find that the clips on the connector are broken, so when you lower it, they pull apart. you probably are shorting out the wire to the signals whenever the wheel is tilted. same thing happened to mine, although mine blows the fuse for the overdrive off switch and auto locks. solution? tape up wire or replace it where its rubbing. I believe my friend had the exact problem, it turned out to be the connector, almost positive it was. We had thaught MAYBE the clock spring, but turned out to be the connector was loose, again 99% sure. Those damn clips are bad for breaking, I've broken 2 now I think, still enough to keep them secured. Thanks Guys Just One More Thing! Looking at the bottom steering cover in the holes that I would think have some type of screw that holds the 2 half's together appear to have nothing in them when I look in them with a flashlight??? Yes I may be a little slow but how do you get the 2 half's of the steering cover off without damaging them like I sometimes do??? I have just devised a repair method for this problem. I discovered this on my truck 2 days ago, and and after reading posts on this and other forums, have learned that it is common. My method does not require a new connector, and does not create potential future repair problems, as gluing the connector in place might do. This took about 20 minutes start-to-finish, once I read up on how to open up the steering column. First, disconnect the battery - you don't want any chance of that airbag hitting you when your face is right in front of it. 1) Use your fingers to pry up the dash trim that surrounds the steering column. It is held by four clips, just like the trim around the stereo and heater controls. Start at the bottom, they just pop loose. 2) There are three phillips screws holding the bottom half of the steering column wrapper to the top half. Take them out. There is a fourth hole used to release the cylinder lock. More on that in the next step. 3) The cylinder lock must come out to remove the top half of the steering column enclosure. Don't worry - its simple. You need a very thin screwdriver or a piece of coat hanger wire. Put the key in the lock and turn it to the "Run" position. There is a small hole in the bottom of the lock cylinder housing. You need to push the wire into that hole to push back the spring-loaded retainer pin, then just pull the lockset straight out. That's what the fourth hole in the bottom cover is for. However, I found it easier to undo the bottom cover and move it aside so that I could see the hole in the housing. 4) once the lock cylinder has been pulled, the top cover can be wiggled out and set aside. See the piece of steel wire that snakes between items #1 and #2 in the picture, essentially creating a new clip where the original has broken off. 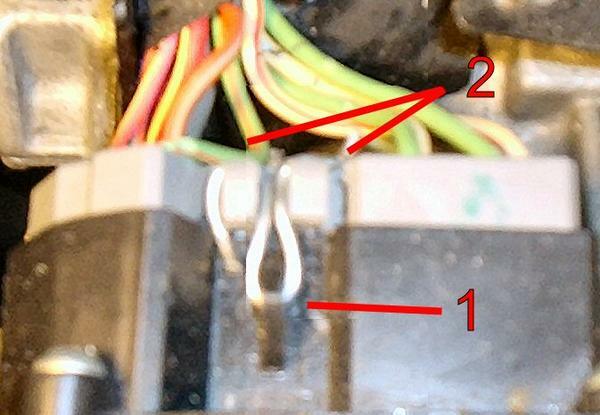 2) Note the triangular bump that would have retained the clip that broke off the connector ( item #1 in the image). With a very small drill bit carefully drill through the center of it,close to the body of the socket. You can only approach it at a steep angle so drill from both sides, until you have a through opening. 3) Use a dremel tool with a small cutting disk to make notches in the back of the connector, directly in line with the broken clip (item #2 in the image) be careful not to cut any wires. 4) Using needlenose pliers, thread a piece if thin, but sturdy steel wire through the hole that you drilled, then wrap the ends around the back of the connector so that it is in the notches that you cut. Note, if you keep your steering wheel very low, or use your tilt mechanism regularly, I recommend that you splice some length into those wires, or stretch them somehow, so that the problem doesn't reoccur. Last edited by dbischoff; 01-27-2008 at 03:47 PM. thanks dbischoff i was just about to take it to the shop and who knows what they would have charged. on mine the right turn and brake light,would only work when column was up.then it quit all together.that orange wire in your picture was broken in two. i soldered in a small piece of wire to extend it so it was longer.only took a couple of hours. thanks again. You're welcome, Timz36. I'm just pleased to be able to do my part to help someone out, to give something back for all the answers I have found within these forums. I was a total Ford newbie when I picked up this sporty '01 Flareside just before Christmas. The contributions of all the other members here have been tremendously helpful to me as I worked through all the little problems that the previous owner didn't deal with. i like the looks of 97-03s also im partial to 73 to79 4x4s.mines do for some changes im gonna do a 3in. body lift and some 35s.i made my own prerunner light bar and added some HELLA 500 lights its only the begining.if anyone can suggest a body lift kit let me know what you used and how you like it.and how hard or easyit is to install.i put one on 77ford 20 years ago.im sure its alittle different now.im an old gas station mechanic.when they used to have them.now im a industrial mechanic so im sure i can doit. let me know how your projects went.and how long they took. thanks! Dbischoff I know your post is over 2 years old, but it helped me fix my problem and save money. If your still around thanks for helping a F150 owner out. Dbischoff - Thank you. I replaced my heater core and this clip broke. I initially followed your post to figure out how to get into my steering column. Good explanation and it worked for me. Thanks! I was trying to figure out what cause a cloud of smoke to come from my steering column. Once inside, it looked like the multifunction switch was the only electrical item of significance so I pulled it out to take a better look. I opened it up and found no cause for smoke. (Don't open up unless you have incredible patience to put back together!) When I replaced the switch I found another issue with terminals backing out of a connector. I later determined this caused fast blinking, intermittent or non-functioning turn signals. They will also cause the hazards to not work. In one case I had just the right rear turn signal lamp not working. To remove the multifunction switch remove the top and bottom torx screws. Now, you need to carefully remove the "top" connector. There are locking ears on both sides that need to be carefully pried back. Use two small screw drivers at the same time. You really don't want to break these as they help hold the connector in place when you tilt the wheel. With the connector removed push the wires all the way in and apply some hot glue to secure them. Let that set for several minutes then re-assemble. For me, this kept the wires in place and the turn signals working at all steering wheel tilt positions. I have some photos in a photo album. Go to my profile to see. Last edited by RogerD; 11-27-2010 at 09:22 PM. Reason: Photos added to profile. This is fantastic! Now we have the instructions to repair TWO of the issues in my truck. Another task to add to my hubby's to-do list. Let's see ... next *issue* to search... marbles under the dash! I was ready to go the junkyard and get myself a new switch but the hot glue gun trick worked like a champ. Thanks for the info and pics!! Quick Reply: Turn Signals Not Working When Tilt Wheel is Lowered?